Clark Kent learns to use and control his powers with the help of the Gem Legion, a group of rogue Gems wanting to protect humanity from any Gems wanting to hurt the Earth. The Kent family tried to be as normal as they possibly could during their time living in Kansas. Of course, things hadn’t been normal since the day they discovered a tiny, red alien crash-landing near their house. Though when they saw how cute and innocent he looked, despite the enormous gem lodged into his chest, they raised him as their own. Surely, they thought, their new child, who burned the grass by stepping on it, and could run faster than any of their horses, was nothing more than a ‘gifted’ child. Nothing changed sixteen years later, when he’s big and grown, and he’s still their special gift from who-knows-where. Even if sometimes, he tries to burn the grass with his eyes near their brand-new house, right in their backyard. He quickly stomps it out. They look out into the forest right behind their home. It was right at the edge of this beach-side city, where it’s mostly run by small businesses making most of their living from tourists, aside from a few bigger companies near the center. Their little mom-n-pop store was a few miles away, near the beach. Though Clark liked their home; the forest was right there, where he saw big trees and lots of shade. A perfect place to hide their tall red alien son. Not that he was hidden away, of course. He’s homeschooled by his mother, and worked on their farm most of his life, so he loved nature and animals. His horses, cows, and chickens had always been kind to him. Other humans, however, not so much. He’s happy, though, with his life. It’s as quiet as can be, for someone who has no idea where he came from, or how he got onto this planet. He tries not to let it bother him. He can’t remember packing that up for their flight to Metropolis. They’d left a lot behind, most of their livestock sold or given away to other farm-owners, though he’d hate to think that piece of his life was gone forever. He walks into the forest, looking around at the scene of nature before him, wondering what this big city has in store for him. “You’re impossible.” She pushes him away lightly, no real malice on her face, though still walks to their temple. As she walks to the door and goes inside, he only sighs, knowing she’s not going to be stopped now. Peridot says nothing, though still looks doubtful. “Oh, I believe that will not be necessary,” Peridot says, putting a hand on her shoulder. All he does is turn her around. She and Benitoite look in the same direction… to find that one of the enormous pine trees at the edge of the forest seems to be trying not to fall over. As usual, nobody responds, as the two run off without him towards the tree. They reach it, and what they see makes them all stop and stare for a moment. At first, in the dim lighting, they believe they’re looking at a human. He has a typical build, big round black-rimmed glasses, and even wearing human clothing, right down to the shoes. Though his skin is glowing bright-red, and there’s a strange five-sided shape glowing through his chest. Peridot summons his visor, and scans the struggling individual. “Perhaps we should help him lower the tree before doing anything rash,” Pink Topaz suggests. Benitoite shrugs. “I think it does. Here, I’ll just…” He walks over behind him, as Pink Topaz and Peridot make their way to the stranger. “I am Peridot, Facet JR-15, Cut B5.” Clark turns to a shorter person, with light hair and a glowing green dot on his forehead, hands folded behind his back. “I do not know any Gem of that name or classification,” Peridot pipes up. Peridot stands absurdly close to him. “I can see your Gem glowing through your shirt. If I may…” He puts a hand on Clark’s chest. At least I’m one-hundred percent sure that’s what it really is. “N-No! That’s private!” He blushes; he’s never had someone just touch him like that. “Uh, listen, my mom’s probably done with making dinner, so… thanks for the help. Bye.” He walks away. “Should we follow him?” Benitoite whispers. He washes his hands and splashes his face with cold water, wondering what on Earth had just happened. Aliens? And they kept talking about gems, like the one on his chest. A part of him wanted to reach out for them… but a part of him also wanted to keep away. “I’m coming!” He dries himself off and walks back to their dining room. In the light of their dining room, he sees now their true colors: Pink Topaz is a pastel pink-skinned teen with long blonde hair that reaches the small of her back. Benitoite is only slightly shorter than her, with vivid blue skin and spiky blue hair, though his goggles resting on his forehead are yellow. Peridot is a variety of colors, though overall desaturated: dull green skin, pale blond hair, and a deep blue uniform, though his eyes and the gem on his head are vivid green. As if today couldn’t get weirder, the universe was going to prove him wrong. Bernitoite digs in, though Pink looks a bit confused at the bowl in front of her, and carefully takes a spoonful and sips it delicately. Peridot, however, only stirs his bowl. “We all live on the beach,” Benitoite says cheerfully. Mrs. Kent gives him a playful smile as she picks up her plate. “Oh, alright, you four play nice, I’ll be eating in the living room.” She gives her son a kiss on the cheek before leaving the room. “We want you to join the Gem Legion.” Pink smiles, standing up to meet him eye-to-eye. “Strange,” Peridot mutters, though Clark tries to ignore that. His thoughts are interrupted when the warp pad glows, and he sees his missing teammates. Each of them hop down… only to reveal a third figure trying to hop off onto the sand and ends up tripping over his own two feet. At those words, Clark blushes… and his skin glows bright orange clearly under the full moon. “He looks nothing like a Ruby!” Alunite counters with. Clark’s uncomfortable; this stranger doesn’t seem to like him very much. “Then he is an off-color,” Peridot states simply. “Are you suggesting a trip to the simulation room?” Peridot asks. The snapping and falling of a palm tree draws their attention towards the forest. “You’re kidding me.” He turns to Pink Topaz. “This is what you guys bring back? Some Gem who thinks he’s human, and hasn’t even used his powers before?” He groans. “Forget this. If you need me, I’ll be doing something useful, and bring back those hide-behinds.” With a mighty leap, he’s off, jumping high into the sky, as Clark watches in awe. Benitoite looks awkward. “Um, listen, it’s your call if you want to come, so…” He gives him a small smile, and morphs back into a sphere, bouncing just as high, going after his friend. Peridot says nothing; he only looks back at Clark, curiously, then follows after his teammates. She stands up, as the pink heart on her chest glows, and from it forms a round, sharp, pink weapon Clark doesn’t recognize. Except there wasn’t just one. As it turns out, hide-behinds are tall, looming creatures, with long, stringy legs, bodies of barn owls, eyes that sparkle like cerulean, and feathers blacker than anything; so dark, it actually stuck out even among the tall trees in the dark of the night near the beach. They can see his two halves hover momentarily in the air before his Gem falls pathetically into the sand underneath the creatures. Pink Topaz brings out her chakram, and aims at the creatures; it hits one of them in the leg, cutting it clean in two, and the creature dissapear in a cloud of dust before it can hit the ground; instead, the Gem from its wing lands in the grass. Clark has no idea what to expect when he runs towards the hide-behinds, no real plan in his mind other than attack!, but it’s in the blink of an eye when he finds himself kicked back and crashing into a rock, shattering it. Next, he’s pinned down by three large claws, as the hide-behind looks into his eyes, curiously pecking at his face. It would’ve been cute, if Clark hadn’t just seen it tear one of his new friends literally in half. Clark groans as the talons begin to tighten around him; the hide-behind’s found his Gem as it gently taps its beak on his chest. Carefully, Clark takes a deep breath, closes his eyes in anticipation, and blows on the creature. He’d almost feel sorry for the creature, as its feathers are set ablaze, flapping its wings to try and put itself out, though its only a few seconds later that it, too, explodes into dust as the Gem attached to its forehead falls to the ground. Noticing this, the other two Gem monsters turn to take down this new threat. Peridot thinks fast; before the bigger one can take a step, he runs over, a large stone in hand, and hurls it, aiming low. The creature, instead of stepping on grass, steps on the stone, and it slips. Peridot grabs another stone, this one much larger and pointier, and quickly carries it towards the still-falling monster, setting it down and crouching behind it. His plan works; the monster is impaled through the chest, and turns to dust, as Peridot remains untouched. Peridot scoops up the teardrop-shaped Gem and encases it in some sort of magical bubble he summons from nowhere. 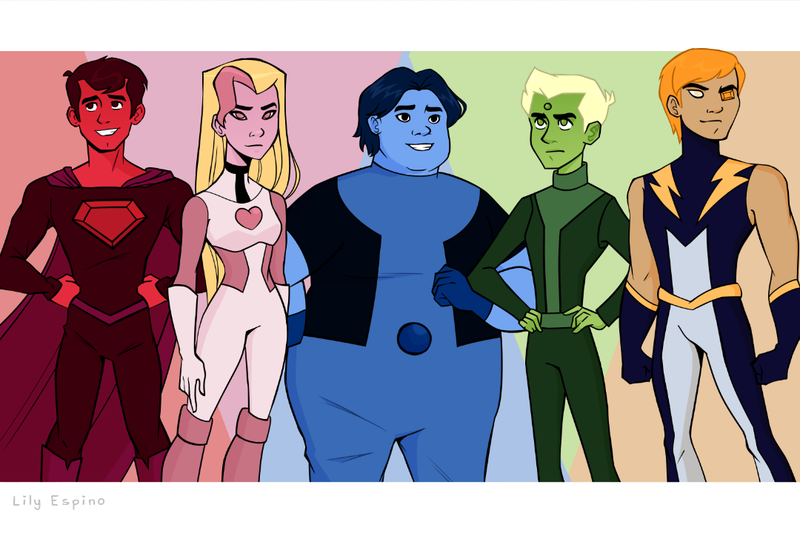 There’s one left, though Clark sees that Alunite and Benitoite have somehow reformed their bodies. The two quickly work in unison; Benitoite turns into a giant sphere again, and Alunite kicks him high into the air, jumping after him, then kicks him as hard as he can, right into the last monster. The monster poofs into dust, and Benitoite collects it, looking a bit worse for wear, though now thankfully in one piece. Peridot and Pink Topaz collect the other fallen Gems, in pink and green bubbles. Alunite coughs “dork!” not-so-subtly, but Pink just smiles, as they lead him back to the beach near the forest, as Clark eagerly keeps talking about their performance. None of them notice a green dot in the sky that was not there the previous night.